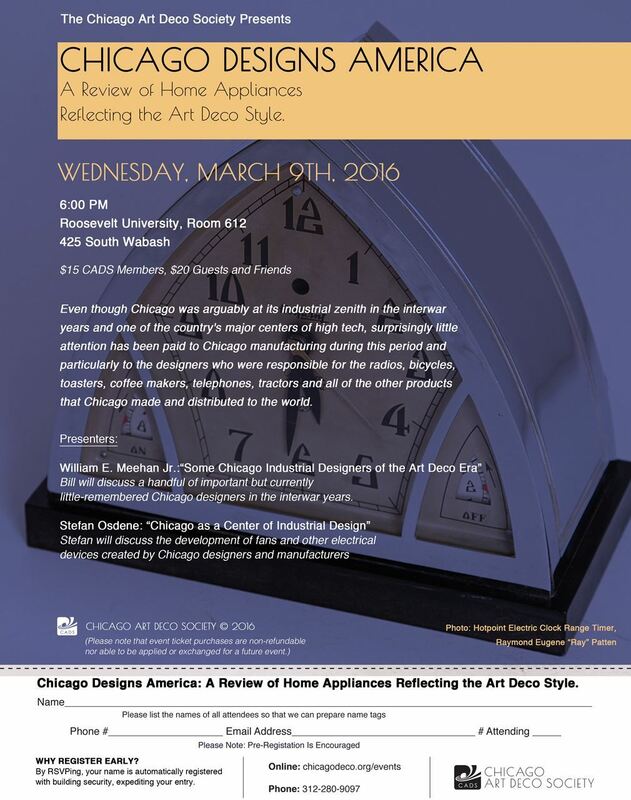 Please join us for a program featuring presentations by two experts on industrial and product design in Chicago during the Art Deco era. Even though Chicago was arguably at its industrial zenith in the interwar years and one of the country's major centers of high tech, surprisingly little attention has been paid to Chicago manufacturing during this period and particularly to the designers who were responsible for the radios, bicycles, toasters, coffee makers, telephones, tractors and all of the other products that Chicago made and distributed to the world. The forthcoming book Art Deco Chicago will feature a number of these designers and their work and here to tell us about some of the discoveries that have been made during the preparation of that book are two collectors and experts on industrial and product design. William E. Meehan Jr.: Some Chicago Industrial Designers of the Art Deco Era. Bill will discuss a handful of important but currently little-remembered Chicago designers in the interwar years. William Meehan is a Philadelphia collector who has amassed a significant collection of household appliances, furniture and accessories of the early twentieth century, a freelance researcher and a contributor to the Society’s forthcoming book Art Deco Chicago. Stefan Osdene is a scholar and film-maker. He holds a PhD in Art History from the University of Wisconsin and has an outstanding collection of electrical machines. He has also made significant contributions to Art Deco Chicago.